The Limerick Tidy Towns monthly award for October has gone to O’Donnell Boutique on Catherine Street, for its beautifully presented and maintained store frontage. Pictured outside the premises at 11 Catherine Street being presented with the award by Maura of Limerick Tidy Towns are Elaine Clogan, proprietor of O’Donnell Boutique, Valerie Conway Store Manager and Ana Aguila, Marketing and Sales. From our perspective, whilst new businesses and modern shop fronts are always welcome additions to Limerick city centre, we get great pleasure in seeing traditional independently run businesses continue to maintain high standards and take pride in their appearance. O’Donnell Boutique on Catherine Street is one such premises as it combines modernity with traditional features, enhanced by its striking brightly painted frontage, spotlessly clean welcoming entrance, consistently attractive window displays and floral arrangements on the upper floors, all whilst maintaining the original signage which is very much in keeping with the streetscape of Catherine Street. O’Donnell Boutique is a family run store which has been in business and providing top-quality fashions for over 70 years. Founded in 1946 by Christopher O’Donnell, O’Donnells is now in its third generation and has seen many changes throughout its time in business. Since it started marketing itself online, the business has grown and taken its existing success to a global wider audience, far beyond Limerick. There are few independent fashion retailers competing with the big stores online, but O’Donnells offer a unique personal shopping experience combined with up to the minute trends and fashion that sets them apart from the rest. For more information, visit their extensive website www.odonnellboutique.com find them on Facebook, call them on 061 415932 or simply call in to their beautiful store at 11 Catherine Street. 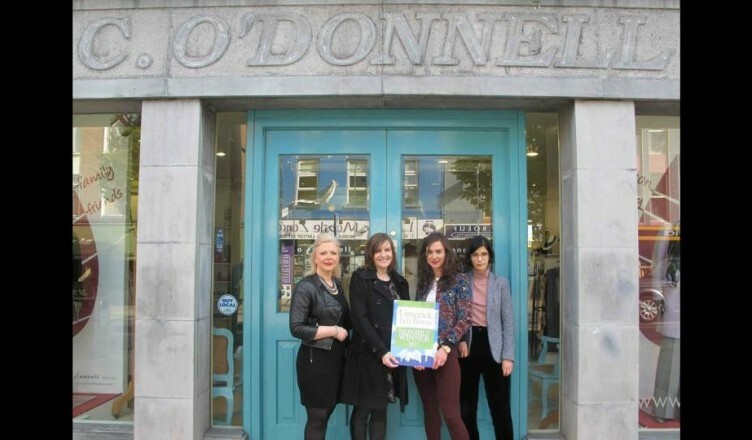 O’Donnell Boutique is the tenth recipient of Limerick Tidy Towns’ monthly awards for 2015, with The Stormy Teacup having won in January, Thomas Street Framing Centre in February, Bobby Byrne’s in March, Parnell Plaza in April, Combu b in May, Figaro Barber Shop in June, Limerick Youth Service in July, The Curragower in August and Keating Connolly Sellors in September. An overall winner will be chosen early next year and if members of the public wish to suggest future monthly winners which they feel merit the award, please do let the Tidy Towns team know. Limerick Tidy Towns would also like thank Fran Fitzgerald of I Love Limerick for taking the photographs for this and all of their monthly awards.